Another excellent President’s Day event took place at the beginning of August. The cricket match saw a top class l’Anson League representative team took on a youthful looking Rowledge team, captained by Shea Taylor. Precisely the same outcome as in previous years, the match went down to the last over….and Rowledge won again! A great advertisement for the spirit and the game of cricket. On the social side of the day, the Mayor of Farnham attended and paid tribute to ‘an outstanding community sports club’ and former Surrey and England cricketer, Pat Pocock said it was a ‘magical club’ and it was the best cricket festival match he’d ever attended. 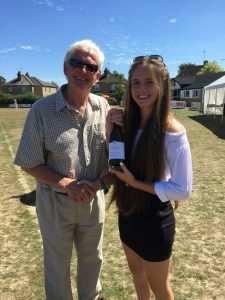 Amongst those who came in for special mention on the day were our own Surrey County women’s player Danielle Gregory, and Cat Bruno for her legendary cricket teas. A special mention was also given to 13 year old Ethan Martin who’d recently scored his first century for the club in senior cricket. The day was extremely well organised by Haidee Goodwin. THANK YOU for everyone’s commitment and efforts, you all make a difference.